The beauty of nepenthes, or tropical pitcher plants, goes beyond their bizarre and curious pitchers. Evolution has prepared a near-perfect insect trap. Nepenthes has been around since the Jurassic period when the continents and islands of the Asia-Pacific, including Australia, were one. They have evolved into highly advanced insect eaters. Most use lures and rewards to bring their prey to the pitcher's mouth. Nectaries on the plant produce a honey-dew droplet of sugars and carbohydrates. While insects are the main prey, others have developed an appetite for larger prey such as rats and shrews. Nepenthes rajah is known for consuming small rodents. These rodents are attracted to a limited source of water and pheromones given off by the plant. Nepenthes ventricosa and fusca produce an attractant that lures ants by providing a high-protein snack. The plant allows the ant to escape and leave trails so that other ants from the colony can return. As ants swarm and start milking the plant of their food, the plant is stimulated, producing nectar that also contains something like alcohol. As the ants drink this, they get dizzy and can be seen walking off in circles into the mouth of the trap. Meanwhile, Nepenthes albomarginata produces a pheromone that attracts termites; the coloration of N. maxima are attractive to cockroaches, and their size makes it impossible for them to escape; N. rafflesiana is colorful with a fragrant pitcher that captures flies, beetles and ants by day, and roaches and moths by night. This very effective species is usually full of bugs. A cluster of nepenthes or pitcher plants will do well planted in composted mossy peat heaths. These plants have adapted to occupy shaded to sunny areas, usually accompanied by high levels of rainfall and/or humidity. They can grow from sea level to near-freezing elevations. Plant them in composted mossy peat heaths to rocky, epiphytic and ultramific coral soils. Water is required for growth and pitcher development. These plants do not grow indoors. They require higher humidity, better air circulation and a steady supply of insects. The fluid within is basically like a thick clear liquid that is neutral until an insect falls in and stimulates the plant to produce digestive enzymes that dissolve the soft parts of its body, melting it into a soup absorbed by the plant's inner walls. The remains fall to the bottom of the trap where microorganisms continue to break them down, allowing absorption by the plant to continue. When a trap fills with insect remains, it starts to brown at the mouth, making it unattractive to insects. 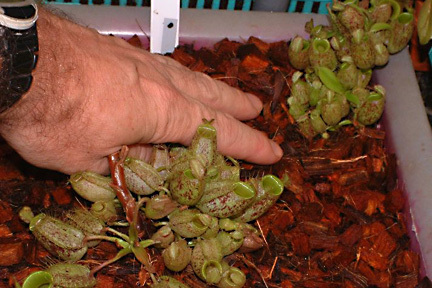 But the pitcher continues to use the decomposing insects to make more nutrients, so it is recommended that the traps remain on the plant until they turn completely brown. Michael Miyashiro owns Rainforest at Ward Warehouse. Contact him at 591-9999 or e-mail rainforesthawaii@aol.com. "In the Garden" is a Friday feature.